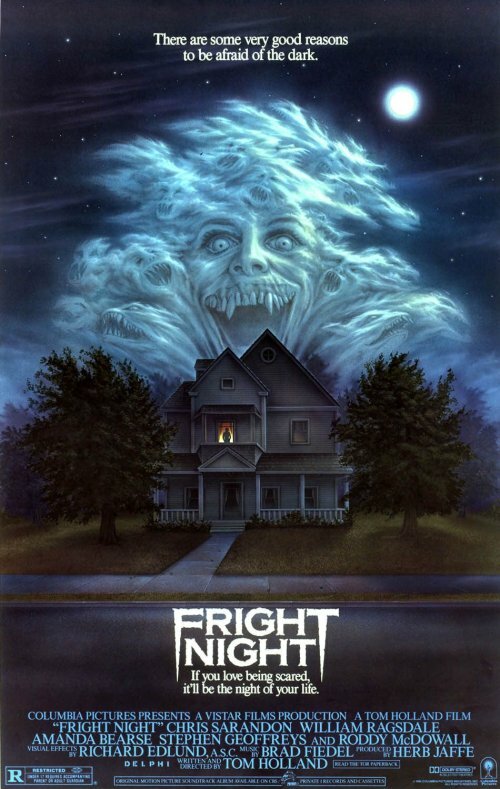 So, apparently Sony is putting in motion a possible Fright Night remake. I’m not particularly interested in yet another remake of a beloved horror movie, but this news did remind me of how much I love the poster for the original. Of course, I first encountered that image in the cover of the VHS, since I was too young to be aware of the theatrical campaign. But it still had quite an impact on young me, and it has been etched in my brain ever since. Such a great way of portraying the idea that there are some frightening things behind that normal looking house. And although it is scary (or at least I thought it was back then) it still manages to convey a certain sense of humor. Which not only makes for a more interesting image but also suits the actual movie quite well. If the remake ever gets made I highly doubt they will manage to come up with a better poster. More polished perhaps, but not better.